Let me say first I actually really like trimming my new stamps, all that wonderful stored potential in new rubber, it's so exciting, prepping a set! (I know it's a very geeky "stamping thing", and not every stamping enthusiast shares with me I'm sure, but I trust at least some of you know what I'm talking about!). I had always been happy with the way my SU! scissors cut rubber, (definitely an improvement over a 3.99 no name brand craft pair I'd started with when I first began stamping, so I felt okay with the 19.95 SU! price tag then because I knew they would get a lot of use), but this past year they've been giving me some problems. The reasons below and all the raves over the Tim Holz scissors I'd read (plus the low price 11.95!) was all I needed to try out a new product! In addition to the numerous features* I will cite, I think the pics speak pretty loudly themselves! Here are the scissors placed on top of the SU! Craft and Rubber Scissors. As you can see, the openings on the handle grips are much wider on the Tim Holz pair. Now, here is my hand tucked into the SU! scissors I've been using since 2004. I'm a petite woman, with relatively small hands, you can see how my fingers fill out the handles. What has four years of trimming my stamps with them done to my hands? Now, here is my hand in the Tim Holz pair. Look how roomy! The wider holes are not any more difficult to hold or cut with, they just allow you to work without the grip hitting your skin. (But if your hands are larger and still DO touch the edge, I can say that they are also smoother and more cushioned than SU!'s). It is a comfortable grip and is not going to make my callus worse. Yipee! If that's not enough to make you want them, let me go on. My SU! pair has probably dulled over time, either their sharpness (or lack of) or the pain from the rubbing has made recent sheets seem more difficult to trim (but you can pay to have them sharpened or buy a scissor sharpener). The Tim Holz scissors, however, have a micro-serrated edge, which will never need sharpening, and just zips through the rubber even better**! It also has this supercool non-stick coating to keep them from getting gunky, they look like fancy high performance cookware LOL! Also has a protective cap, which is a nice feature. (The packaging also lists they "resist rust and corrosion", SU! 's probably do, too, but I don't know so can't really say much on that) All these things together would make me expect to pay 2 to three times the actual price tag for the Tim Holz pair, I'm still shocked they don't cost more! Isn't it wonderful sometimes you can still manage to get "more than what you pay for"? **I wish I could provide pictures that would show the detail of the edge or a way to portray how much more cleanly they go through the rubber, but you'll just have to take my word for it, too small to capture in a pic! Linsey and Barb have been having so much fun making shaped cards lately, I decided to be like them and make one, too. :) An unexpected fold or shape always makes a big impact! To make the umbrella, I scored and folded my Cameo Coral CS to A2 size, and glued a piece of white CS inside (to have a nice contrast after I did my umbrella cutaway). Next I took a thick, black marker and sketched out an umbrella (look at the stamped image as a guide) with the top left side going along the fold and the handle extending down to the lower left corner. I trimmed out two pieces of Cool Caribbean CS for the contrasting sections, (they're not a perfect match, that's okay!;). I cut through both layers around the top side of the umbrella, then just through the top layer around the underside of the umbrella and the handle. Now the handle and umbrella top will rest on the table when your card is standing up. Isn't that cute? Inside I added the two flamingos I'd colored with Copics (Light Prawn (perfect with Cameo Coral! )and Blush for the flamingos, and Pale Aqua for the water and umbrella) and cut out, then popped up on dimensionals. The umbrella top and puddle are from Just So Hoppy. 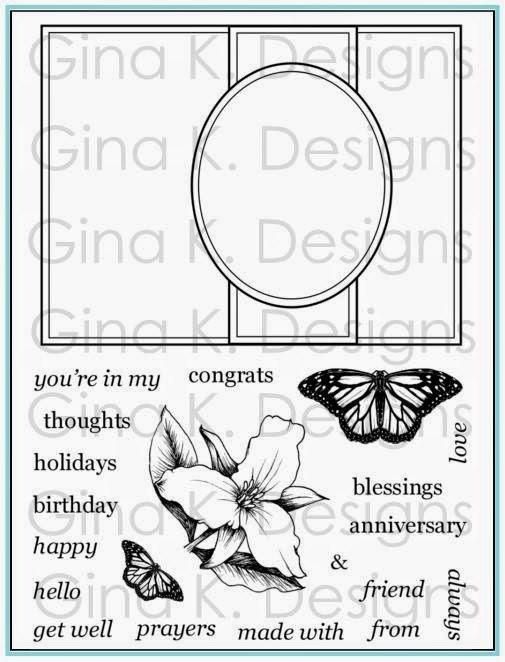 I thought I should accentuate the unique arc inside by curving my greeting, which I did by cutting my greetings apart, laying the block on top of the card, and placing them in a curve to match. Hope you're inspired to go make up a shaped card of your own, I'd love to see what you do, so if you come up with something I hope you'll share by linking it here! Finally got my two favorite snakes* inky! You can't tell by looking, but if you gave this card a little shake, you would hear a very lifelike rattle! It's a shaker card! The beads in this hidden shaker are behind my image. Instead of seeing the beads rolling around like a snowglobe in a traditional shaker which always looks oh-so-pretty, I just needed a sound effect for my shakin' snake tail LOL! Assembled like a regular shaker without the acetate, just make a small square outline of dimensionals or foam tape on the back of your focal point, pour in your beads, and then adhere to a another piece of CS. Since you can't see the beads in this one, they need not be your pretty (pricey) micro or colored beads, just whatever makes a noise, dry rice would work well to if the grains are small! I incorporated two of this weeks SCS challenges (sketch and color) for this card. I'd been meaning to use two of my folders to represent the different snakeskins and I thought this layout would be a fun way to do some color blocking, just run your CS through your CB with the Mesh and Tiny Bubbles folders and then punch with your 1" or 1 1/4" sqaure punch and mount them on dimensionals. I stamped the snakes twice and then cut out a pair and popped them up on dimensionals on top of the first, so you'd see the litle shakey lines around the tail. The image is colored with ink pads and my Aquapainter. (I mixed my Old Olive and Garden Green ink together to match my Wild Wasabi CS since I don't have the matching ink.) Their bodies are covered with my Clear Spica. The little self-adhesive rhinstones included a color that were a terrific match for the Taken with Teal CS, I was so excited to see that! I used Classic and Scalloped Square Nestabiliites to create the mat. Some other fun images I think of using/needing a little shake sound effect added would be with a rain or sprinkler image, maybe with a grill for some "sizzling" burgers etc! The waterproof labels are the perfect solution to decorate a bathroom or kitchen tin. (Be careful though, they are WATERproof but NOT OIL proof, so don't be getting them gunky with other oily, sticky bathroom products!) I stamped my border in Silver Encore Ink to match my tin on my waterproof label, I think these delicate "metal" lines adds such a an elegant, custom look! I used the "Botanical Dream" set again to match my bathroom, I love this sketchy sprig image, it can look like dried or fresh herbs, or a delicate bunch of flowers! One of my favorite herbal combos is Rosemary and Mint, relaxing and refreshing, so I stamped it in the corner in Mellow Moss, stamped off, and then stamped it again in black and colored in the leaves with my matching moss marker. I added "Dream" with Palette Noir (remember it doesn't matter what ink you use on these, it'll still be waterproof! amazing!!) Next I wanted to make the background match the tile that surrounds my tub, so I sponged over my image with River Rock, Mellow Moss, and Going Gray filling it out , trying to create both some light and dark areas, as well as letting some white show through, and going back in with my SU! 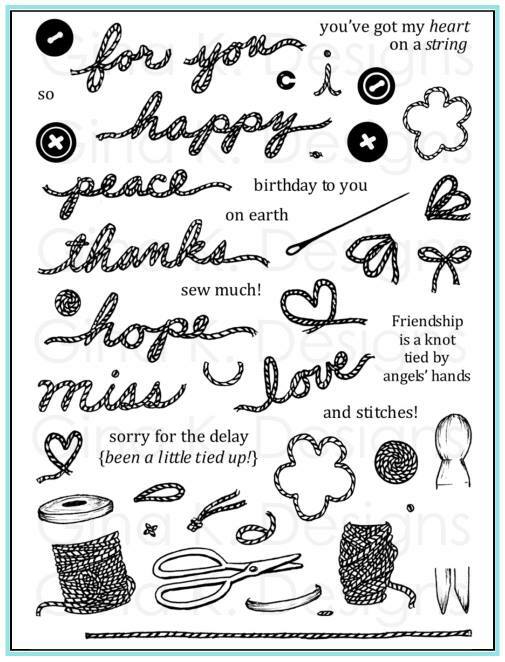 Itty Bitty Background speckle stamp in Black and the Mellow Moss(you could also use an air gun), looks a lot like stone in the end and very simple to do! Last, trim, peel and stick! 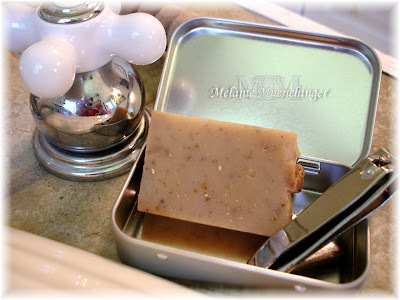 Inside I added my soap rosemary mint soap and there was still room for clippers. hee hee, I just noticed if you enlarge the pic you can see a reflection on the faucet of me sitting in the bathtub with my camera ! Labels: Asela Hopkins, Gift, Gina K Designs, What's in Your Tin? When you want to give some hugs and kisses, let them know how much you care and bring them by the BAGFUL!!! I stamped the leaves all over the front and back of the bag* in Old Olive, turning the stamp as I went , to match my SU! 5/8 grosgrain. I wrapped this around the little ties that grip the sides to hide them, and rolled the bag down in the back instead of folding. (You don't have to untie the bow to get it open, you can just push it down or slide it off.) I added the little "Love" stamp from "Rectangle Greetings" to my ribbon on dimensionals, I plan on using this set a lot more now that I finally got the Extra Jumbo Scallop punch to fit the rectangles! (The longer greetings and font in this set, too, are adorable with all the hugging animals) The koalas are colored with Koh-i-Noor pencils, cut out and attached to the window on the outside with dimensionals. I cut apart the smiles from "hugs and smiles" (since I can put it back together so easily on my block) and added "kisses" then punched it with my SU! 1 1/8 circle. I layered this on a black 1 3/4" circle, an olive Scallop punch accented with black dots, and slid in a Nestabilities ribbon tag accented with Zoo brads. I can't WAIT to give this to my friend! (who just moved! and has three kids! and stamps like a dream! (like a Queen?!) :) Any guesses?? 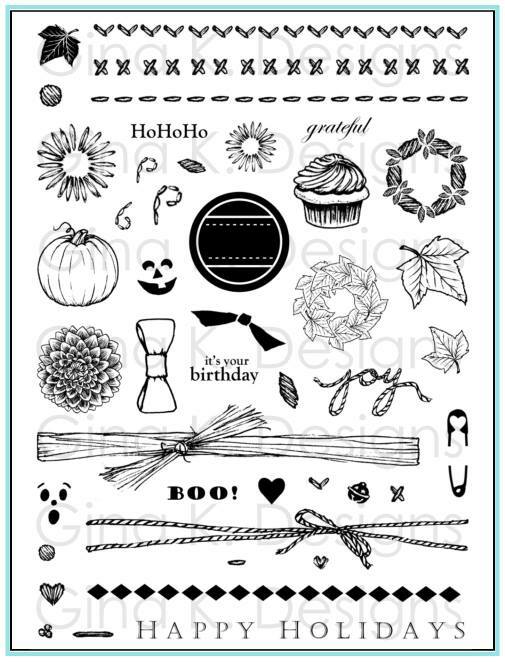 *Instead of a stamped leaf background, you could also stamp the hug and kiss greetings randomly all over ("never be the first to let go of a hug", "hugs and kisses for the Mr. and Mrs." for a couple shower/housewarming etc! PS Maybe I'll write to Hershey's and see if they can make me a "Cuddle" (chocolate kiss with hazelnut, coffee or lavender filling) What do you think? I LOVE they she put the Bashful Blue and Pretty in Pink together, using both of these (his and hers!) colors in her CS, DP, gingham AND taffeta ribbon, it's so yummy! (DP is from the SU! hostess prints pack). The spiral clip and big white brads (I just gotta pick me up some of these brads, they add so much dimension and always look so terrific next to a white punched greeting like she did here) are kind of her "signature" embellishments, she uses these a LOT to great effect. Put all these things together and your eyes just dance around the card again and again, taking it all in, way to go, Jessie! Now go check out her blog for another peek from her using this set! Check back next Thursday for another "Cuddles and Hugs" project from Jessie! When cats hug, they use their tails! 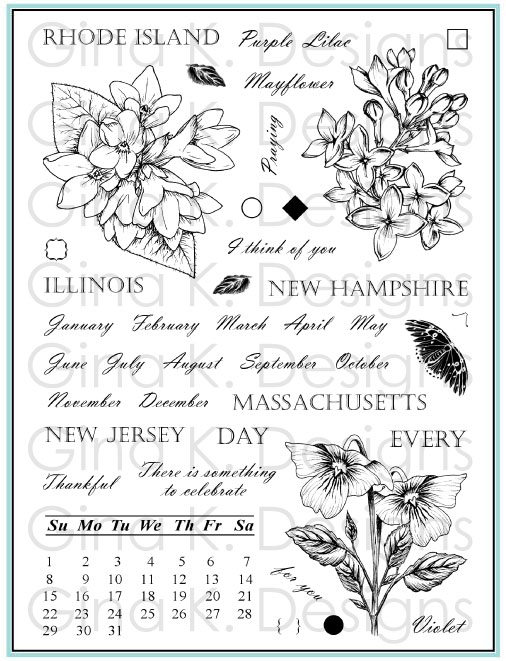 The flowers you see outside are from the pitcher bouquet in this month's Free with Three set, "Friendship Blooms", and the butterfly is from "Just So Hoppy". Cats are colored with Koh-i- Noor pencils and the backyard is done with markers and sponged ink for the sky. CS is SU! Chocolate Chip and PT White, ribbons are SU!, DP is Magnolia. Thanks for stopping by, please come back tomorrow (Thursday) for a project from my Guest Designer Jessie Rone! *Don't the embossed lines look just like a window molding? (This was MUCH easier than trying to DIY like I did on this card!! ) (wow, I just noticed the date on that, I uploaded this three days before I gave birth to William! )To make the window frame, you need to run your Nestabilitie die through with your C and B plate (remember, "C" for "cutting") then emboss around the the hole with your two B plates (and shims and mat if you need them with your machine, "B" emBoss") then cut around your embossed rectangle window either with your cutter or a nestabilitie the next size up to frame up the hole. Adhere the acetate behind that, then your stamped scene behind that. My son Jonathan loves to wear a little "pirate" 'do rag on occasion, especially in the summer. When I saw the new Kindred Greetings for kids set, I had an idea for personalizing his bandanna with all these loving, kid-friendly affirmations! "You can do it!" You're Awesome!" " I love how hard you try!" "You're such a team player!" "I'm so glad you're mine! "* on an on! Aren't these the best sentiments?! (I don't know why nobody ever thought of a set like this before!) The font is really great, too, not just because it's cute and looks handwritten, but because it's so easy for younger children to read on their own, which they love being able to do. * because he's already getting too be a teensy bit too cool for his mom on occasion (now that he's a first grader) I purposely left off the "No matter how big you get you'll always be my baby!" stamp! Although this stamp will get a LOT of use (because I know he would be really pleased to read that in a card privately), he's at a stage he would not want that on his head for all the world to see! When I saw this dress image in Rupa's set I knew it was time to try this diamond score pattern I'd seen on Debbie's blog using my Scor-Pal! The white on white and silver sparkly accents add to the drama and elegance! Although not "retro", it certainly makes me think of a "chic" Boutique! To make the skirt two-tiered, perfect for a bridal shower or wedding, mask the dress and then stamp it again as low or high as you like for a custom hem. Stardust Stickles accents the sash, straps and scallops, and shadows were done with a warm gray 20% Prismacolor marker. I cut the whole thing out, mounted it on dimensionals on top of my Scallop Oval Nestabilitie (also on dimensionals), and "hung" one of the mega rhinstone brads (pierce a whole through the nestie die cut, insert your brad, and then just slide the top of the hanger underneath). I used a large oval punch for the "celebrate" tag and "embossed" it by tracing the small oval punch win it with my stylus. I poked another brad though and then wrapped it around the side of the card, securing each end with dimensnionals. Here are some Cuddles and Hugs tips to get you started now that your sets are arriving! 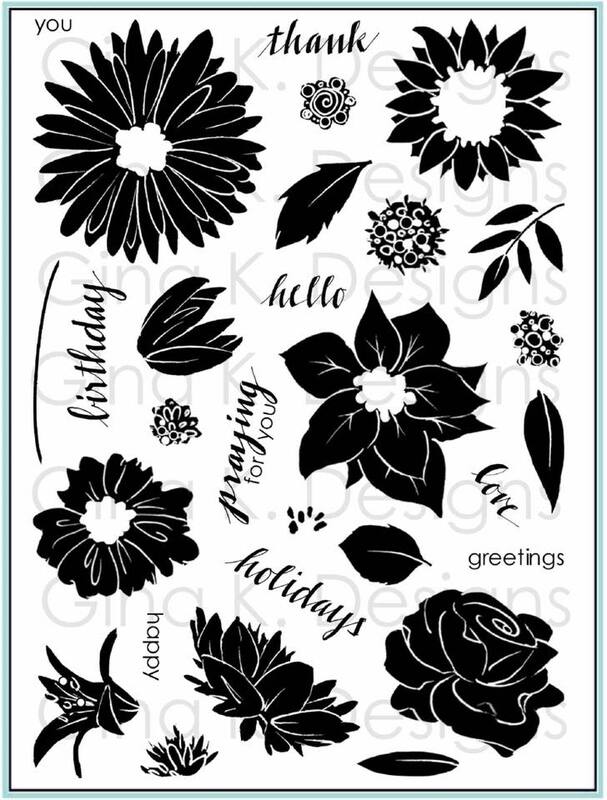 Make a subtle, elegant background on your card base or mat using the leaves and Versamark. Mask the leaves or tall grass in front of or behind your wild things to put them in the jungle where they belong! Cut out the grass or leaves and pop them up on dimensionals. Put the little eucalyptus branch in the koala's mouth or hand. Try Fun Flocking your animals to make them extra "warm and fuzzy"! Accent your "Cuddles and Hugs" projects with the matching Gina K Zoo brads. The snakes look terrific with several of the Cuttlebug embossing folders: try Tiny Bubbles, Mesh for a"scaly" look. Snakes aren't always brown or green, get creative or look at photos or snakes online for some fun and fabulous color combinations! Use part of the "Just So Hoppy" puddle around the flamingos knees to make them look like they are standing in the water. Make a shaker card (without the window, just beads inside) for your snakes to add a little "rattling" sound effect! 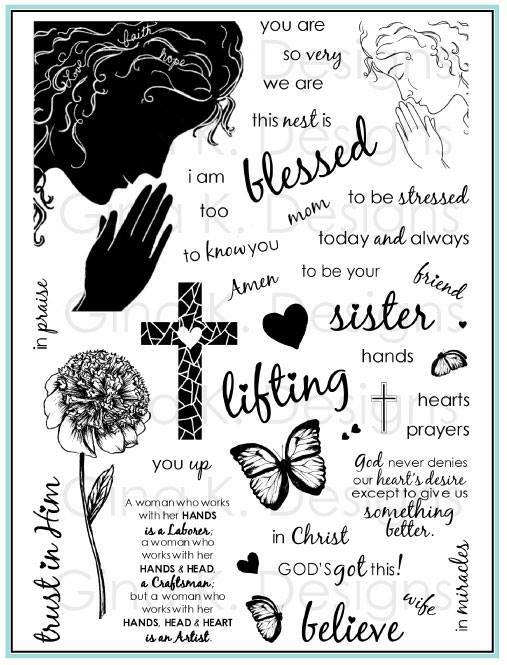 Have fun taking all the relations stamps (mother father etc) from Hip Hop Accessories to complement your Cuddle and Hugs greetings and customize the images for you and your recipient. Example: sister and brother tags for the koalas, husband and wife for the lions etc, no rules about what these animals "are" to each other, you decide! 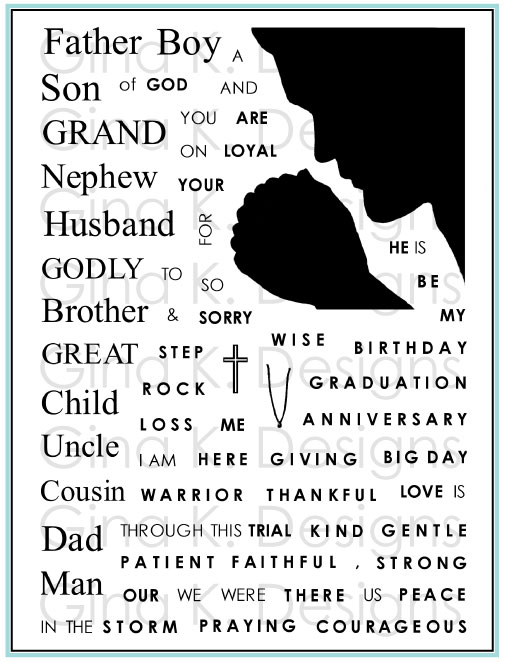 The big and little expand your Hip Hop Accessories greetings even further! Now you can make "new big brother", "sweet little princess" etc! Accessorize them accordingly(hats etc) from Hip Hop Accessories or offering balloons and flowers from Just So Hippy and Just So Hoppy. "Sending hugs and smiles across the miles"
"hugs and kisses(hisses) for the Mr. and Mrs"
"wild thing I think I love you"
"wild thing you make my heart sing"
I can't take a bath without having at last one candle to lit to keep me company! Make a little tin for yourself or for a friend so you can take your candle garden any where you go and turn that bath into a relaxing, spa experience, a hotel bedside into cozy place like home, or any little corner into a contemplative space. I stamped my label border from "What's in Your Tin? 1" onto some DP that came in a Hobby Lobby value pack, aren't those little river stones perfect? Then I stamped "Dream" from Asela's new Botanical Dreams set, this is one of my favorite fonts, it's so elegant but earthy! I added a tealight and then poured in some green sea glass, I love this in bathrooms! You can find a bag of sea glass very cheap in the candle/floral section of any craft store. Close it up and you're ready to take it on the road! If you give it as a gift, consider tucking inside a small book of matches covered with a coordinating DP or stamped paper. I am really excited about all the greetings in this set, I tried to covered the whole playful, silly, serious, (song lyric!) spectrum! One greeting I added specifically for this image was "thanks for taking me under your wing". 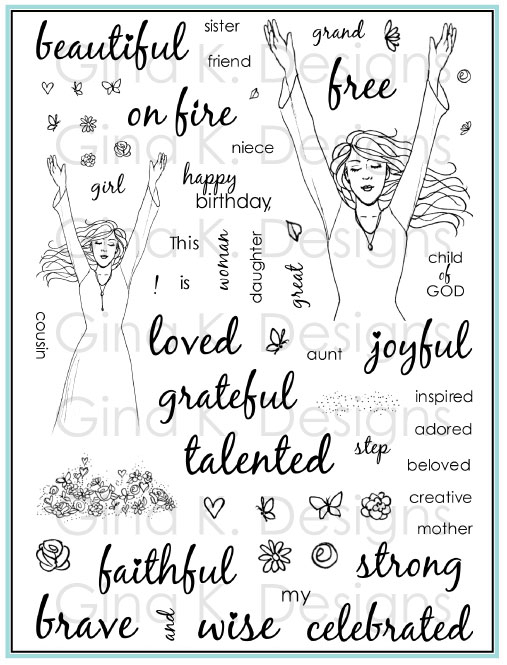 I don't have any sentiments like it in my ginormous stamp collection, but I think it says so much, and is perfect for so many people/occasions in our life. I'm so thankful for everyone who has taken me under their wing at one time or another, to shield me from troubles, as well as to mentor and nurture me. This "sketch" was inspired by a leftover tuquoise oval I had cut for my shadowbox that was still on my desk, I ran it through my Cuttlebug using my D'vine Swirls Folder to make a little "pool" for them! I used the my corner rounder with the guide off to make the scalloped border in my Cameo Coral CS, to make waves with my turquoise strip underneath. 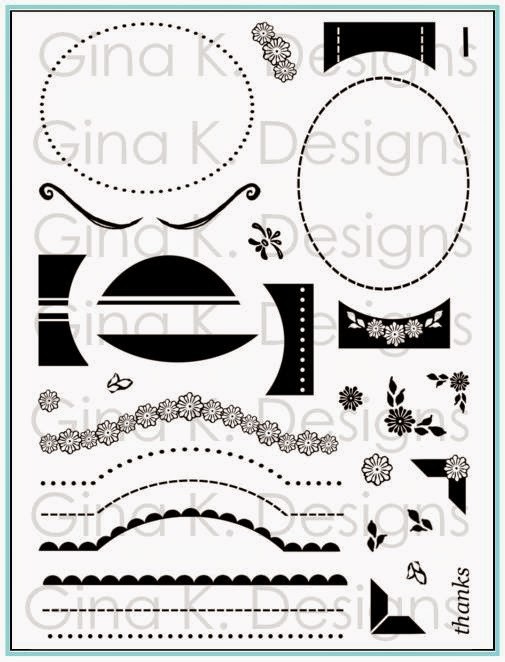 I added just a few of the new Gina K adhesive rhinestones, there are so many fun colors in this pack! I chose the one of the green shades. The image was colored with Koh-i-noor pencils, OMS and blending stumps. 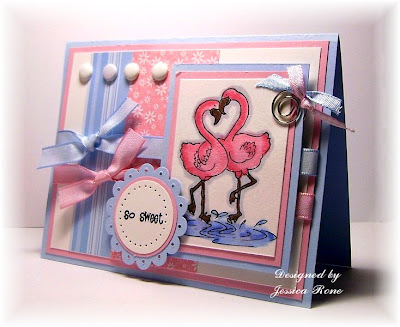 The top layer of my flamingos are cut out and mounted on dimensionals over the stamped image. Some tall grass in the background from this same set and my puddle from Just So Hoppy finished up my scene. While we're on the subject, have to share a very famous local spot/nursery, popular for it's over-the-top flamingo display on a very high traffic corner...only in Austin!! *No lashes on these(flamingos have super beedy eyes) but I really like how the one has its eyes closed (just enjoying the moment) and the other is just looking on happily, enjoying the moment, I still see a bit of twinkle in there(if it's possible in just a tiny dot!) don't you? Every time I look at this image from my new Cuddles and Hugs set, I just want to yawn, streeeeetch, and curl up for a little catnap with somebody(after circling around, and then kneading for several minutes of course!) This stamp was designed to give to anyone you love, or that is in love with somebody! I was inspired by this "You are My Sunshine" card of Joanne's when I saw the "lion colors" and the sketch, it looked like the sun behind that chair, so I had the idea to create "a place in the sun" for these big cats (if you have cats, you know they will always pick that one little patch of sunlight on the floor!) I changed the sketch a little to make it work with my scored design, what do yo think? To create this look, I turned my mat at an angle on my Scor-Pal (did you know you can buy these now from Gina K? Yup, add it to your order (or buy separately, but how you can you resist all the other goodies?) and shipping is free!) and made a diagonal by placing the top right corner and bottom left corner over a track and scoring. Then, I moved the CS over about a 1/4 inch, turned the CS a few degrees, scored again, repeating this process till I got to the edge, and going back and working out toward the other side until it was full of sunbeams! I almost always have the light source coming from the top right, so if you try this look, make sure your coloring matches your angle. I used the Koh-i-noor pencils and OMS and blending stumps to color the lions, there are some terrific yellows, oranges and browns in this set for these lions and they coordinate beautifully with my So Saffron and More Mustard CS. More details: My image is popped up on dimensionals. I used my Classic Square and Circle and Scallop Nestabilities for the mats, and SU! Apricot grosgrain and retired organdy. "Hugs and smiles" is stamed in Palette Noir , just one of many greetings from this set that work with this image. I had the opportunity to meet her at the swap in Arlington, and was able to hold the samples she'd made for My Favorite Things as their Guest Designer for the month in my own hands, her work is even more stunning in real life! Although I got several other amazing submissions from other designers for this contest that I know would have worked very hard and done an outstanding job, I felt her style in particular would be a fabulous way showcase my newest set. She is VERY excited about these new stamps and has been busy creating samples(but you'll have to wait for a peek, for now you can peruse her awesome gallery), you'll be able to see the first in just a few hours along with Gina's and our other design team members, I can't wait! I will also be featuring her projects weekly on my blog this month, get ready to "ooh" and "ahh"! Jessie has been stamping for six years and is on the Paper Pretties Team, becoming their Design Team Coordinator last month. 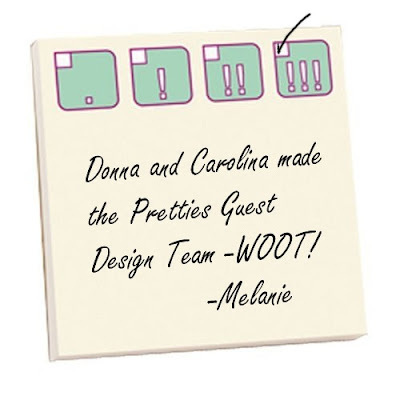 She was also been a guest designer of the month for My Favorite Things. Leave her some love here or on her blog! Congrats, Jessie! 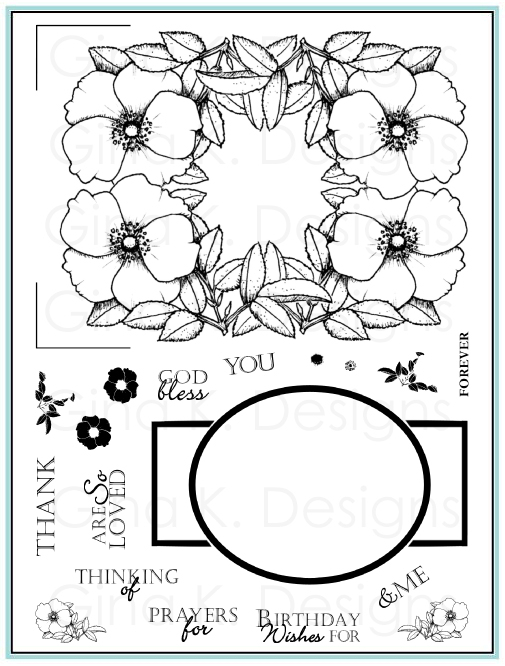 Sneak Peek #3: Friendship Blooms: Free with Three! I colored the images with my Copics and held my breath as I attempted to make my shadow in the shape of my vase and flower arrangement with my Pale Aqua Copic. I find taller, thinner objects easier to recreate a realistic cast shadow, the more irregular and large the object is I have a more difficult time figuring out what that would like, and I chicken out just make a standard oval shadow(which works, too!) I added a tiny knot of yellow ribbon on the vase for some pop, I love these colors together! (I tried to keep my layout simple and free of other embellishment to focus on the image and that busy background!) BTW, that background can be made from the scraps of this FREE set (plus a couple others) LOOK! Start at one end and work up (or down) rather than outlining and filling in toward the middle. After getting a few rows done I did pick out my straight edge scrap and and made a line up either side to fill in, but waited til near the end to add the top. Use the straight scraps from the edge of your rubber sheet around or the outside of the background stamp, they are already straight! It's easiest to trim your pieces into triangle and trapezoids at first, keep the sizes pretty uniform(although you will need to add a few smaller pieces when you're almost done) Grab a piece and look for a spot that looks like a good fit! It's okay if they are not perfect shapes, an irregular edge adds to the beauty, makes it look "shattered"
Keep them approximately the same distance apart for your "grout". These are about 1/8" apart, to match the size I normally pick for my mats. It's not necessary, though, to have every area filled perfectly. If you need to trim a piece to make it fit with your others, just take off a little at a time and test it so you don't end up too small a piece. Please help me welcome our newest illustrator, Asela Hopkins! I am so thrilled to be working with her and her images. When I first saw her "Botanical Dream" set, I knew it was time for me to update my bathroom decor*, the first I'll share today, the rest you'll have to come back to see! This uses one of my favorite images in the set, a potted orchid. ** To me, they are the epitome of luxury and elegance. I really wanted this project to have layers, so we have a sentiment on the front piece of glass, the image in the middle, and a terrific quote in the back. I got this beautiful shadow box at Hobby Lobby (all frames on sale this week, half off, that made this one only 7.50!) It came with the pearl straight pins to tack up your pictures/papers. Such a great look and so easy to commit, being able to change it (uncommit!) whenever you want! I colored the orchids** with the Koh-i-noor pencils. Personally, I always love being given these little hatch marks on an image to show me where to shade, fool proof! :) The texture of the watercolor paper made it a bit difficult to completely blend and get down in all those little nooks (you can't), but I like the way it turned out, wanted the texture to match my background. (It also gave the pot a nice texture to match my rustic tile.) After cutting, the long delicate, stem was very fragile so I taped on a piece of wire to help it stand up right and hold it's shape. I made a a little "L" bracket out of a piece of white CS and adhered it with dimensionals to the back of my image and the bottom on the box in the middle. This gives so much dimension to the project! Unfortunately, my photography doesn't do this project justice, looks much better IRL! Hard to get close enough to not get a glare/reflection on the glass, hard to show the shadows of both the potted orchid and the "Believe"Where is Kurtis when you need him??! ;) (if you click on the photo the "Believe" is casting a very large low shadow, other times it looks more like it has been "stamped off". "Retro Boutique", where have you been all my life?! If I knew Illustrator THIS is the kind of a set I would TRY to create (although Rupa did it SO much better than I ever imagined it!) Isn't this little dress to die for?? Wait til you see the other images Rupa gave you to play with in here (methinks Rupa either has a smokin' HOT wardrobe, or covets one!! LOL!) This set comes out on the 20th, the big reveal of it during the release party Friday night! So anyway, I am so jazzed over the hanging rod!!! (can you tell what it is?) As soon as I saw the little dress on the hanger I knew it needed hanging, but I wasn't sure how I would best achieve that: wire(which I hate), I could draw a rod ("meh"), maybe a ribbon? (getting closer...) I was still undecided as I cut out my dresses, when, happy accident! my son Jonathan plucked something poking out from under the rubble on my desk and asked"what's this?" " It's a hatpin", I mumbled, still cutting, something I jab onto a card sometimes when it needs a little something (or has a sewing or hat theme). Wait a tic!! Eureka!!!! Finally! hatpins have a special purpose!! Tie a little bow or knot of ribbon through the loop end and thread some beads, pearls "spacers"*, what have you, add the cap, then attach with some sticky tape or gel glue and press firmly over the stamped hook of the hanger for the perfect rod! Both dresses were stamped and paper-pieced with the DCVW "All Dressed Up" Pack (the background is also from this pack, many pages, like the "black dress", pre-glitterfied! ), the best DP evah!!! I highlighted the waist on both dresses with a white gel pen and stamped a third dress onto some white paper to make the little petticoat underneath the black dress since it overlaps(and popped up the skirt with dimensionals). Last I stamped "you're just my style!" (lovin' this deco font!) one of many fashionable greetings in the set on a Spellbinders ribbon tag die and pulled a pink double-stitched ribbon(Hobby Lobby) through. The tied ribbon at the bottom right balances out the tied ribbon at top left, in case you were wondering how I decided which way to put each :) The focal point BTW is a Nestie Classic Rectangle. If you came here first (thank you!!) 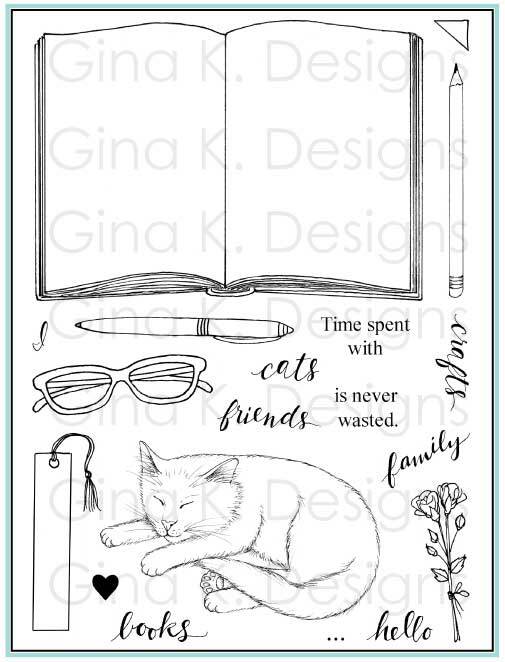 be sure to drop by Gina's blog to see her sample of Rupa's set plus links to the other designers artwork with same(and the chance to win the stamps)! Tomorrow, sneak peek # 2, a new illustrator's in the house, get ready!!! why my son keeps putting stuff UP his nose?! (and it's always the same nostril) (I figured I'd go ahead and ask about it here because there's always someone reading who's an expert on ____!) I know many young kids try this, but it's usually a one-time thing, right? Now if you turned out for April's release, you may remember that during the party my 3 year old William lodged a band aid in his nostril(to the point where we couldn't see it), which 30 minutes after the retrieval resulted in a bloody nose(but fortunately, due to my calm, collected nature(yeah, right!) and with the help of many in the forum, no trip to the ER. We'll call this "Incident #1". The following week, he did it again (no blood this time) Last week, it was a cardboard jigsaw puzzle piece. A few days ago, a huge wad of gum. (Please believe me when I say this was a rare treat, I don't normally let them have gum, Jonathan have never even tried gum until this past year(so of course William discovered it, too) and when I saw him in the process of stuffing it in (this was the first time I'd actually caught him in the act, all the other times he would come to me and say "me put a ____in my nose, pease get it out") and when I yelled "NO! ", instead of pulling it out or pretending he hadn't done it or whatever you'd expect a normal kid to do when caught shoving up something up his nose, with both hands he started frantically working to get it all the way in before I could get it away from him!! The last (latest!) incident (#5!) involved a piece from a Perfection game, he broke the handle off(what a clever boy!) so he could cram them both in!! In the meantime I do not have a card to post I can show you today, as I am cranking out sneak peeks BUT: you don't have to wait long! The sneak peeks start tomorrow, the first will be here one minute after midnight!!! So EXCITED!!!!! PS I have been trying my darnedest to alert everyone about my challenge by leaving little message for people to give them heads up about by searching online, I hit a lot of you this morning, but know I'm missing a LOT who have my sets, there has got to be a better way!! So please go upload if you 've made stuff with my sets!! :) The free set is calling your name!! *yeah, I know I misspelled "knows"! If this card looks tiny, it is! I made it for a 3x3* My Favorite Things Challenge last week. Isn't the poodle being such a good girl waiting to make her wish before diving into her cake? Any dog-lovers out there? I'm guessing lots of you really do up their birthdays! Some less than this, but some even MORE I'm sure!) I just thought it would be so cut to omit one friend and have this sassy poodle dining with her human! To make it fit the card, though, I also had to trim the sides, top and bottom since the original image was a large rectangle, AND I had to cut the image in HALF, trimming around the left side of the table slide the poodle just behind the cake to splice the two parts together! can you see my seam? I did a bunch of sponging and tried to add some more dramatic shadows across the face and table to create the illusion of a slightly dimmed room and a lit candle. The DP on the card and envelope is DCVW All Dressed Up, what a great investment this mat pack was! I used the scallop and circle punches to make the seal on my envelope, and the 1/16th punch to makes holes in each scallop hump, then added adhesive rhinestones to the little flourishes and also to the hodgepodge frame. All the stamps for our new release arrive tomorrow, I am so excited to get working on samples for the party and gallery, the sets are all amazing!! I know I say that every month, but I love, love, LOVE my newest set and I hope you fall in love with it, too! I've be scrambling to find other things to share in the meantime, but the good news is, sneak peeks start on the Tuesday, the 17th! You'll have four days of previews here and on Gina K's and the other DT members blogs, can't wait, can't wait! Please don't forget to go enter at least one thing for the upload challenge to win my new release! Yes, you have a whole week, but doen't risk saving it for the last minute and then running out of time, (right now there are only three people playing, those are pretty good odds for you, right, at least for the time being?!) ;)Remember, it can use any of my sets, and the drawing is random! Back tomorrow, I've run into a bit of a snag with my Father's Day project so I might just have to photograph it partially finished to at least give you the gist of it, but we'll see, miracles do happen....! Upload projects using ANY of my 6 sets (Just So Hippy, Just So Hoppy, Hip Hop Accessories, Jumping for Joy, What's in Your Tin? 1 and 2) to the SCS gallery** with MMGKD1 in the keyword section when you upload. I will put your name into a hat for every upload using my stamps you submit between now and next Friday, June 20th, 1PM CST. (Upload three things, get three entries, etc) These can be cards you have posted on your blogs but haven't yet uploaded to SCS, and/or completely new projects, just not something that you've already put in the gallery, okay? (Anything previously uploaded does not count.) Feel free to incorporate any of the the Splitcoast challenges you like, color, sketch, etc but there are no requirements from me on what you choose to do. I will not be picking a "favorite" from these (but you can be sure I will dropping by leaving comments!) they are just for everyone to enjoy and get inspiration from. ;) I will draw one name out of the hat and reveal it during the release party June 20th in the Gina K forum! 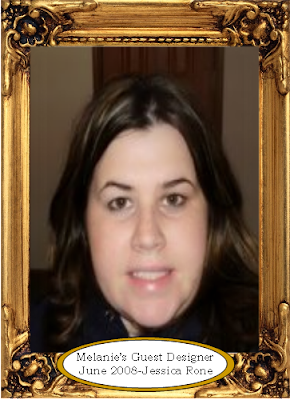 , and this person will win my new set! Please spread the word, I am SO appreciative of everyone who owns these sets and I want to be sure to see and appreciate the artwork of each and every person who inks it! *(If you are floored you weren't chosen based on your freaking amazing entries, let me just say that I chose whose style and samples I felt would best showcase this month's set ( because I've already seen it, ya know?) The concept and creativity of some entries I got would lend themselves terrifically to sets I have already designed and have planned for release in the coming months, as soon as I saw them I thought "she would probably make fantastic projects with (fill in the blank)set! 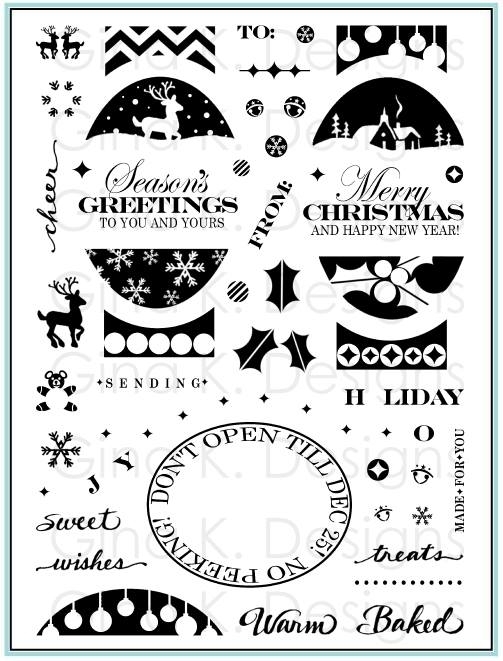 (and there are some surprises coming up, styles and stamps that will be very different from my previous sets, wait til you see!) So I really hope you won't be discouraged and keep trying, I think about all the past work I've seen from you (plus others) when making these decisions, but it is tough, I tell ya!